The Empire State Building is one of the most iconic structures in the New York City skyline with one of the best views of the city. But rather than just tell you that, the Empire State team has built the Share ESB site to show the skyscraper and the views in an authentic light from their community’s perspective. Highlighting this content from their fans gives them the ability to not only tell you how great their experience is but also show you with endorsements from their community. The authentic views that are gained from displaying this content gives potential visitors to the landmark a better perspective of what to expect from their experience. Not only does this content provide authentic views of the Empire State Building, it’s also drives a lot of engagement on Instagram to promote the skyscraper. Instagrammers find posts from their friends to be more engaging than branded posts so the user-generated content that the Empire State Building is encouraging is extremely valuable for their marketing efforts. The Share ESB site also creates the unique opportunity to drive engagement between the Empire State Building and their most passionate fans. The people who are sharing this content are showcasing their enthusiasm for the building and everything it represents and the Empire State Building responds with matching enthusiasm for the participation. When you’re able to encourage your community to share content promoting your brand, the passion from your loyal fans shines and gives you some incredible promotional user-generated content. The Empire State Building uses the Share ESB site to let their social and web traffic complement each other by bringing the social content to the website. When you’re building a display like theirs to highlight content from Instagram it’s important to follow Instagram’s display guidelines. The main details to remember are to provide full attribution to the Instagrammer who shared the post while not modifying or confusing the content shared from Instagram. Whether you’re designing a new site or giving your current site a facelift, consider leveraging UGC to increase your community’s sharing and give your fans that added bonus of engagement. Any brand can learn lessons from the Empire State Building on how to build authentic promotion on Instagram. Always create opportunities to highlight authentic content from your community and use those moments to engage those fans that are driving the sharing. When all of these experiences can be shared on your website you’ll see some incredible results! 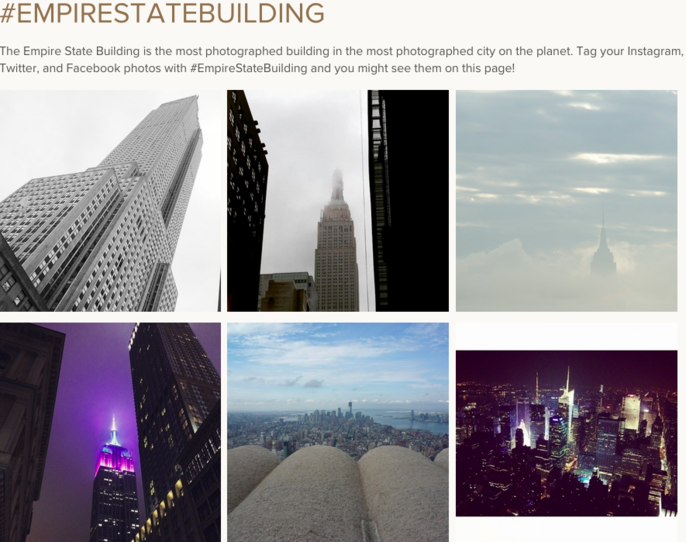 Download our Instagram Campaign Planning Guide to launch your next Instagram contest like the Empire State Building. Is Social Advertising Subverting Social Media Marketing?